The share of employees who are covered slides to 48 percent when public-sector, often unionized, workers are stripped out of the NCS; when part-time, private-sector workers are added in; and when one counts only the share who actually participate in an employer plan when it’s offered to them. These are plan participation rates at a given point in time. Two-thirds of U.S. households, by the time they reach their 60s, have a retirement plan somewhere in their work histories. But many workers have little to show for their efforts, if they moved in and out of jobs that may or may not have offered some type of plan. The remaining one-third of older households have no pension coverage at all. Too many people are marching toward retirement without much of a plan. I find this subject very confusing on several levels…1) are you including 401(k)s, 403(b), etc. as retirement plans? 2) besides government work or unionized labor (where the coverage is through the union and small in numbers), how many other private sector employers actually offer a “pension”? 3) I know it is a subject for another discussion, but relevant none the less, how about the solvency of these plans. They are all drastically underfunded and in the government cases, about to bring down the government entities (state, county & cities) that created them. It is a house of cards and if the government keeps making changes on the 401(k)s, etc. that program is not as enticing as before. It was once sold to the working man as a REPLACEMENT for pensions. 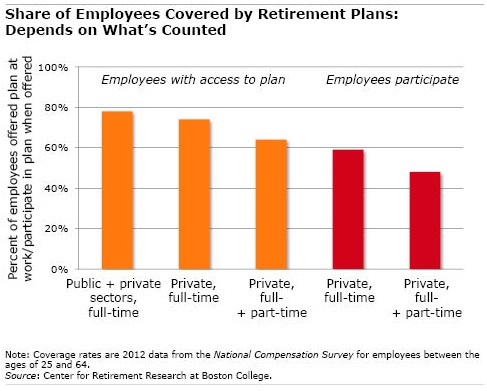 The estimates of pension coverage include both defined benefit and defined-contribution plans such as 401(k)s or 403(b)s. But since the focus here is on the private sector, defined contribution plans are more relevant (defined benefit plans are mainly in the public sector).